Astronomers have observed the motion of distant star clusters to measure our galaxy’s mass. The new estimate places the Milky Way in the lightweight class of galaxies. Considering we call this galaxy home, we know surprisingly little about it. Even its mass has remained contested — we still don’t know if the neighboring Andromeda Galaxy is bigger or smaller than our own. The question has occupied great minds for decades (including Stephen Colbert’s back in 2009, click link for video). Now a group of astronomers led by Gwendolyn Eadie (McMaster University, Canada) is throwing its hat in the ring. Eadie announced at last week’s winter meeting of the American Astronomical Society in Grapevine, Texas, an unexpectedly low estimate for the Milky Way’s mass. The result is also published in the Astrophysical Journal. 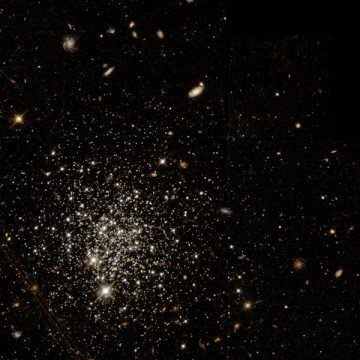 The globular cluster Arp Madore 1, imaged here by the Hubble Space Telescope, is the farthest globular cluster in Eadie and colleague's sample at 400,000 light-yeras from the galactic center. The reason for the wide range in estimates for our galaxy’s mass is two-fold: first, it’s hard to measure something when you’re inside it. It’s like trying to understand how airplanes fly when you’re sitting in a passenger’s seat. But that's just the half of it. It’s also quite difficult to measure something you can’t see, and invisible dark matter dominates the Milky Way’s mass. Astronomers make do with what they do see, namely the stars in the Milky Way’s halo. Eadie chose to use globular clusters, spherical collections of old stars that largely lie in the stellar halo, outside the disk. The farthest of these floats 400,000 light-years from our galaxy’s center. There are two drawbacks to using globular clusters, Eadie acknowledges. The first is insurmountable — the fact is that while 400,000 light-years sounds like a long way away, the galaxy’s dark matter halo extends quite a bit farther, out to 1 million light-years. So even the farthest stars in the Milky Way’s halo will still be limited in what they can reveal about the galaxy’s mass. The workaround is to make assumptions about what the dark matter halo looks like. It’s an unsatisfying option, to be sure, but it’s the only one astronomers have. The second problem Eadie faced was more manageable. It wasn't enough to know the positions of globular clusters in space, she also needed their velocities — and that’s not easy. While spectra can measure an object’s Doppler shift, revealing its velocity along the line of sight, measuring an object’s motion across the sky requires oodles of observing time and super-sharp images, such as from the Hubble Space Telescope. Not every globular cluster has been so blessed with telescope time, so the data is incomplete. Incomplete data is difficult to deal with, so it’s often thrown away. Eadie estimates the mass of the Milky Way using the motions of globular clusters in our galaxy's stellar halo. The range of values she obtains is marked by gray shaded regions (dark, medium, and light gray represent the 95%, 75%, and 50% confidence regions). Other mass estimates from a wide range of studies are marked with colored symbols. The new mass estimate lies below many previous estimates. G. Eadie et al., Astrophysical Journal, 2016 October 1. 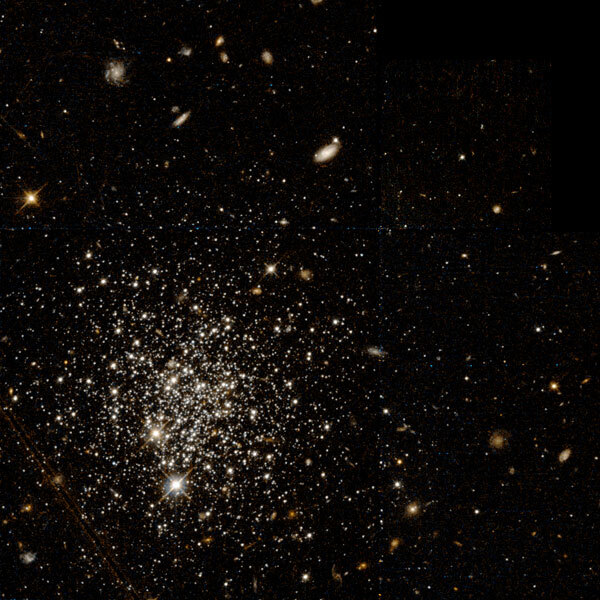 But since throwing away data hurts astronomers’ hearts, Eadie came up with a way to incorporate even the globular clusters without information about their motion on the sky. Her statistical technique increased the number of globular clusters in the sample by 60% and, moreover, gave her access to the most distant globular clusters (including that one at 400,000 light-years), which don’t typically have proper motion measurements. These distant stars are essential to getting a good estimate of the total mass. 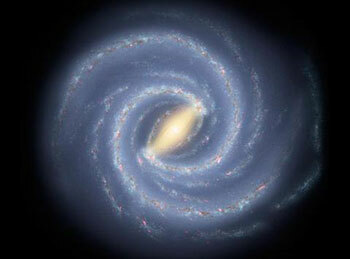 The result: the Milky Way contains between 600 billion and 750 billion Suns’ worth of mass within 600,000 light-years. 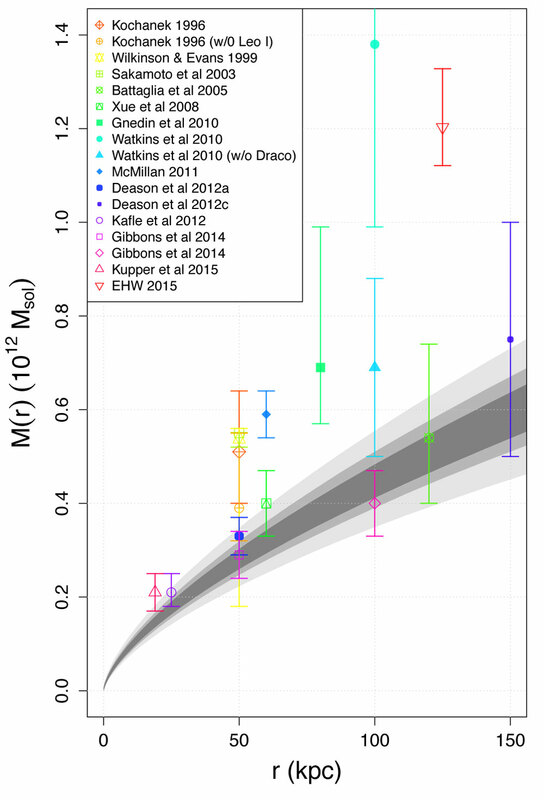 This version of the mass estimate goes a bit beyond the farthest globular cluster, so it includes some extrapolation but is also easier to compare to previous studies. Eadie's estimate is significantly below previous measures, which have put the Milky Way’s mass at roughly a trillion Suns. Case in point: Dennis Zaritsky (University of Arizona) and Helene Courtois (Lyon University, France) claim in a recent study that mass estimates well below a trillion Suns imply too low a fraction of dark matter. Since astronomers know the dark matter fraction via other methods, that ought to rule out lowball estimates such as the one obtained by Eadie and colleagues. As Yogi Berra would say: "It ain't over till it's over. And it ain't over yet." Ultimately, the mass question will likely remain an open one until astronomers obtain more well-studied, distant probes of the Milky Way’s halo — for which the European Space Agency's Gaia mission and the Large Synoptic Survey Telescope will be essential — as well as a better understanding of the dark matter that surrounds the galaxy.